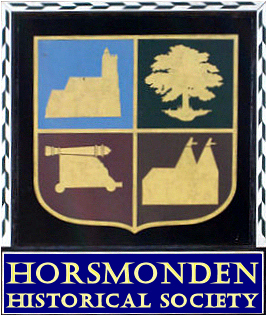 The Society exists to provide a regular meeting point for members of the Horsmonden community who have an interest in local (and perhaps wider) history. The annual subscription is currently £15. Toni Mount, author & mediæval historian, Henry VIII: hero or villain ? Visit will include a guided tour of the house, a cream tea & visit to the gardens. Admission: £8 per head, Tea £5.50 Advance booking with payment to Cathy Olney by 29th June. The Social Club War Memorial Plaque, containing photographs of 40 of the Horsmonden WWI Fallen and first displayed in 1925, is now available online as an interactive facsimile, with links from each thumbnail image to a full-size image with informative caption and (where possible) a link to the relevant Commonwealth War Graves Commission record. Following the withdrawal by Google of Picasaweb, these images are now hosted locally and are fully zoomable — using the scroll-wheel to zoom in/out will re-sample the high-resolution original, thereby avoiding any loss of quality when zooming while at the same time reducing to a minimum the size of the resulting data transfer. The same technology is used to present the Marriott will and the Institute lease.